British Tars, 1740-1790: What other sources can we use? The focus of this blog is contemporary images. Paintings, engravings, sketches and the like provide the material that I've chosen to examine. Though I've said it in previous posts, it bears repeating that this alone cannot be the only way to explore sailor's clothing. 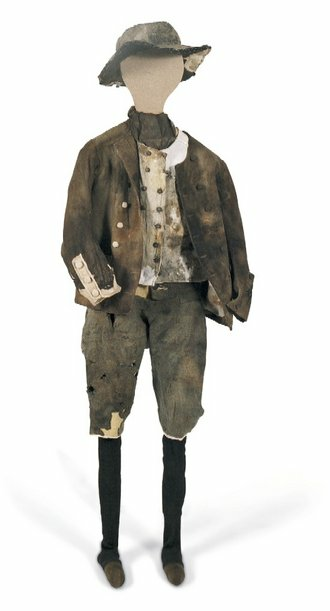 One of the best sources for eighteenth century sailors' slop clothes comes from the wreck of the General Carlton of Whitby, which sank in 1785 off the European coast while carrying a load of pine tar. The casks of tar burst when she hit the bottom, and coated much of the ship. When she was discovered in the 1980s, a wealth of original artifacts was recovered. You can read more about the wreck here. Another excellent source is written documents. For this example, I point to the blog With Messrs. Wallace, Davidson and Johnson. The blog follows primary source documents from a merchant firm in colonial Baltimore. Of particular interest in the long list of goods sold as "slops" to crews in Baltimore! When we combine material, textual, and visual primary sources, it is much easier to round out our image of common clothing in the eighteenth century. Newspaper ads for deserters and runaways, should yield some references. There were several works written about pirates in the period, that should have a few tidpits in them too. True! Desertion notices are particularly helpful for the navy. What's great about sailors is that merchant captains often put out ads for runaways as well, opening another avenue for us to explore!